Everyone who started Disgrace finished it – no passes, which says a lot, though the most common phrase of the evening was, ‘well, I can’t truthfully say I enjoyed it,’ but points were high. Beautifully written, it is a story that drew us in and kept us involved with David, the caddish professor and Lucy, his determined daughter. 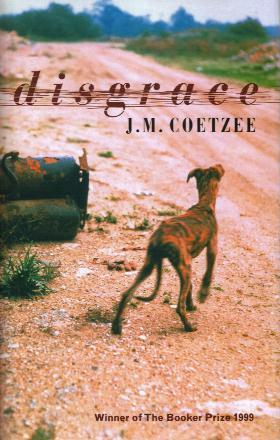 Coetzee somehow compelled us to follow their sad and difficult lives through to the book’s rather abrupt, confusing, possibly hopeful end. When it was published in 1999 Disgrace drew criticism for its bleak portrayal of a lawless South Africa groping toward a new balance of political, economic and social power; a new order unable to cope with all its frustrations and resentments and leaving casualties. The one act of horrific violence which Lucy and her father survive was never completely understood, confronted or controlled. Yet the novel’s conflicts need not be seen as unique to South Africa. In the context of any new order involving drastic change, David and Lucy were two souls learning to deal with the reality of their powerlessness and vulnerability, and Coetzee made us live it with them. Not an enjoyable story, but a human predicament which stirred deep emotions and could be approached from many angles, provoking intense, though perhaps overly polite?, debate. Our next book will be our first non-fiction, The Marsh Arabs by Wilfred Thesiger.